1851 Census - Comberton, Camb. Link to specimens catalogued by Herbaria at Home. The Rev. William Williamson Newbould was considered by his peers to have been among the most significant British botanists of the 19th century; a reputation he acquired despite the fact that he published very little in his own name. He was morbidly self-effacing and is mainly known as a collaborator with other botanists, numbering amongst his friends Prof. C. C. Babington, H. C. Watson and J. G. Baker. Although an ordained priest he had resigned his curacy by 1860 and devoted the rest of his life to botanical pursuits, with the exception of a short appointment at Honington in the 1870s. Honington was the seat of his close friend Rev. Frederick Townsend. 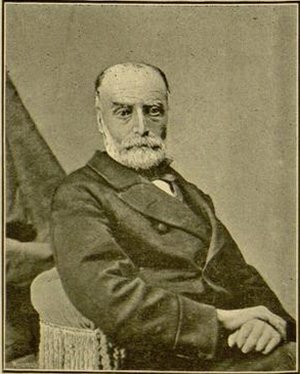 He married in 1855 and raised a family of six children, the youngest, Sir Babington Bennett Newbould, achieving fame as judge in the High Court of Calcutta. Despite this, by 1871 he no longer appear to have been living with his wife and family, perhaps explaining in part Babington's cryptic obituary comment "... for his life was not altogether a happy one, owing to circumstances which it is not necessary to state here, and which do not in any way concern the readers of this Journal." His latter years were spent in lodgings on Kew Green. 1819 : Birth 1819 April 13: Baptism of William Williamson, son of Henry and Mary Newbould, at Eccleshall-Bierlow, Yorkshire. Most authors give his date of birth as January 20. 1842 March 1 : Botanical Society of Edinburgh Contributed botanical specimens from Britain and the continent to the herbarium of the Botanical Society of Edinburgh. He contributed specimens from France the following year. 1846 September : Curate Comberton To William Borrer, Esq. St. John's College, Cambridge, June 12, 1846. Yours very truly, Charles C. Babington. 1848 July 15 : Comberton "Newbould brought me Orobanche picridis from Comberton. I went there with him and gathered plenty of it in a field just within the parish of Toft, at the end of a field lane to the left of the road." MARRIED. On the 18th inst., at Child Okeford, Dorset, the Rev. William Williamson Newbould, son of Henry Newbould, Esq., of Sharrow-bank, near Sheffield, to Mary Louisa, younger daughter of Lieutenant-Colonel Fendall, late of the 4th Light Dragoons. DEATHS. NEWBOULD. - On the 16th inst., at Montague House, Kew, The Rev. William Williamson Newbould, M.A., aged 67.